“My name is Cindy Swift and I am a survivor. Our Labrador (now 13 months old) saved my life. I was diagnosed with Ovarian Cancer at age 41. On Mother’s Day, May 10, 2009 our Labrador puppy tripped me and I landed on my left kneecap. One week later I went to the emergency room with severe calf pain and was diagnosed with a DVT (Deep Vein Thrombosis – blood clot – the DVT was caused by the cancer) and also put on crutches for an ankle injury (result of the fall one week prior to the visit to the emergency room). While beginning treatment for the DVT and waiting to see an orthopedic surgeon for my ankle I developed a fever and a cough that wouldn’t go away (the cough had been progressively getting worse for about 3 months). Since the cough wouldn’t go away I requested further testing – my internist ordered a chest CT Scan (June 22nd). On June 22, 2009 the doctors found an 8-10 cm mass on my right ovary and I was told that “it does not look good and is most likely Ovarian Cancer.” My blood work a couple of days later showed my CA125 levels to be over 400. On my second visit to my oncologist I was admitted to the hospital because of running high fevers that just would not go away. On July 7, 2009 I had a complete hysterectomy and spent a total of 12 days in the hospital. I have since received 8 chemo treatments (last one on January 7, 2010) and hope to have a full recovery (first follow-up CT Scan is scheduled for late February 2010). 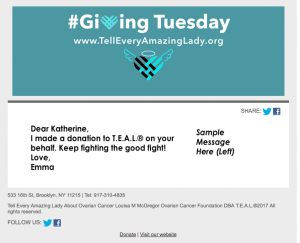 I am very fortunate in being diagnosed in Stage IIa – my cancer was only on my right ovary and had not spread anywhere else. My symptoms were very vague and really only included abdominal bloating and some random cramping (not severe). As we look back we found that my symptoms also included the fever and cough – the fever and cough went away almost immediately after my surgery. After my diagnosis my oncologist had me see a genetic counselor to further investigate why I have Ovarian Cancer. I tested negative for the BRCA 1 & BRCA 2 genes and am waiting for possible further testing for Lynch Syndrome (hereditary nonpolyposis colorectal cancer (HNPCC)) – people with Lynch syndrome have an increased risk of cancers of the stomach, small intestine, liver, gallbladder ducts, upper urinary tract, brain, skin, and prostate. Women with this disorder also have a high risk of cancer of the endometrium (lining of the uterus) and ovaries. We have also discovered that there has been a family history of some of these particular cancers as well. “Sitting in my home office writing this, I look around the room that was once Gail’s nursery… wonderful memories of bringing this precious little bundle home from the hospital … the white wicker bassinette sitting just behind where my chair is now. Fast forward with me the pre-school years of being a stay at home mom, dancing across the kitchen floor with Gail standing on my socked feet, piano lessons, tricycles, lemonade stands, bicycles, Brownie scouts, cheerleading, band practice, ball games, children – then teenagers hanging out at our house. Thirty years of holidays, vacations, laughter, a few tears. A special mother/daughter relationship – a bond like no other… unconditional love. Gail graduated from Silver Bluff High School with honors in 1994 and was attending USC in Columbia when she was diagnosed with ovarian cysts. The cysts were surgically removed and everything seemed perfectly normal for years. Gail continued attending college, transferring to USC-Aiken before graduating in 1999 (she jokingly said she was on the five-year plan). Gail worked at Publix in Aiken during college and her Target career began with the opening of the new store in Aiken shortly after graduation. “Abi” as she was called by her Target team, later made career moves to Charleston, Summerville, then Florence, SC. While some women may have changed doctors for convenience after they moved, Gail trusted her doctor in Augusta and continued seeing her for yearly examinations. In 2005, when Gail was 29 years old, she wasn’t feeling well and thought she had cysts again. At her next appointment she asked the doctor for a sonogram and was told that the pain she was having was from scar tissue from her earlier surgery and a sonogram wasn’t necessary. Gail and I discussed this at length before she drove back to Florence – with Gail finally telling me, “but mom, she’s the doctor”. The pain and discomfort did not go away. Gail went to a chiropractor near Florence for back pain – and had spa massages, too. Her paternal grandmother had recently been moved to an assisted living facility near Aiken and Gail desperately wanted to be close by to visit – so in the summer of 2006, she transferred from Target in Florence to the Aiken Target even though it meant stepping down from an executive position. She was finally nearby – close to family and friends and working five days a week and in retail THAT is practically unheard of. Everything was wonderful… and we were looking forward to the holidays already. No more rushed traveling to spend holidays or days off together. Gail settled in to the new job, enjoyed being within minutes of nieces and nephews, church, friends and family. She joined Curves – and was named their ‘biggest loser’ of inches and pounds her first month. Gail at times seemed tired, but she attributed that to the new job – at least that’s what she told me. She went to a prompt care medical facility with back and body aches the week before her upcoming appointment. A friend and Target team member later told me that Gail was having extreme pain at work the weeks leading up to this next appointment. And I was unaware of the over the counter medications Gail was taking for upset stomach, etc. In October 2006, four months after Gail moved back to Aiken, at what was scheduled as a routine annual physical, a “mass” was found. Within a week, Gail had major surgery – and the mass was soon diagnosed as small cell ovarian cancer, stage IIIc. Rounds of chemo quickly followed and I was thankful that, even though Gail kept her apartment in Aiken, she stayed with me during this time. Gail was able to focus solely on following doctor’s orders and family members made sure she had what she wanted or needed. Her faith remained strong and she knew she’d “be ok” regardless of the outcome. Gail asked me one day, “What if the chemo doesn’t work?” We discussed not being able to imagine what life would be like without the other one here… how difficult it would be… and that regardless of which of us went first, we’d save a place for the other one in Heaven. That may not have been the perfect answer – not that there is one – but I never expected the two of us to have a conversation like that. The bottom line was we knew that regardless of the outcome of this battle with cancer, we’d see each other again. On February 14, 2007 — less than four months after her annual checkup — Gail, my only child, became one of the estimated 15,250 women who lost their battle with ovarian cancer in 2007. I had a choice – I could grieve myself to death or I could make something positive out of this horrible experience. I did what Gail would’ve done if the roles were reversed… I chose to make a difference in ovarian cancer awareness. In April 2007 a Relay For Life team formed by family, friends and co-workers in Gail’s memory. Our team, Gail’s Anatomy, celebrates those fighting cancer and those that have won the battle; we remember those that have passed; and we fight back by sponsoring ovarian cancer awareness events year round. The team has raised more than $20,000 for the American Cancer Society with all funds directed to ovarian cancer awareness. Ovarian cancer awareness events have been held at Washington Savannah River Company; Curves for Women; the Aiken Mall; URS Washington Division in Aiken; PowerCuts Salon & Spa; Target stores in Florence, Charleston, Mt. Pleasant, Summerville and Aiken, SC; the Town of Jackson, SC; USC-Aiken with the softball team (10/4/08 and 10/3/09) and the basketball teams (12/13/08 and 1/13/10); as well as Jackson Middle School, Midland Valley High School and Fox Creek High School. Other businesses have joined the awareness campaign, which include: Lamar Advertising (in Augusta, GA), Denise Jane Portrait Design, Innovative Solutions, Jim Hanna Sports, Necessary Arrangements, Up & Away on Laurens Street, Aiken Chamber of Commerce, and Newberry Hall in Aiken, South Carolina. URS Washington Division Headquarters in Boise, Idaho published an article in the Employee Communication newsletter during September (Ovarian Cancer Awareness month), which was distributed to their employees worldwide. Billboards focusing on ovarian cancer awareness are displayed during the month of September. This website was highlighted in the August 2009 CSRABereaved Parents newsletter to promote ovarian cancer awareness. Skirt! magazine featured ovarian cancer awareness in the 24/7 Q&A section of the September ’09 issue and Augusta Oncology Associates staff wear our “Fight Like A Girl” t-shirts each week in support of ovarian cancer awareness! Gail did everything right. She had gynecologic exams every year since she was 18 years old. She even went to the same doctor. Gail had none of the risk factors; there was no known family history of ovarian or breast cancer, but this horrible disease introduced itself to our family. Gail discovered after her diagnosis that she had all the symptoms of ovarian cancer except one. We both thought that a yearly physical and pap test would detect any potential female problems. We can’t change the past but we can certainly make a difference now by taking steps to educate others. Don’t let this happen to you. Pay attention to your body – you know yourself better than any one or any doctor. If you or a loved one are experiencing symptoms, follow the recommendation of the National Ovarian Cancer Coalition and see your physician. Insist on a CA-125 blood test and a transvaginal sonogram. Early detection makes a difference… early detection saves lives. Together we can make a difference in the fight against ovarian cancer. Let’s begin with you. Thank you for reading Gail’s story. I want to compliment you on the extremely well run walk on Sat. I live in the Catskills but made a point to come down to Brooklyn for the walk. (I was diagnosed about 5 1/2 years. And while my journey goes up and down, I am still hanging in there.) I am so touched, impressed and moved by Louisa and all who made this event happen. It was a privilege to do my little part of putting one foot in front of the other. My story is to let all women know of the importance of getting your yearly exam at the gynecologist and following up on abnormal tests. Back in January of 2002 I went for my normal papsmear and week later I received a phone call that I had abnormal cells and it looked like dysplasia. This was the first time I ever had a bad pap smear so of course I went into hysteria and called all of my female support and everyone told me dont worry everyone gets a bad pap smear. So I went to the doctor for the follow up visit and they did a coposcopy and found a spot and sampled it. A week later it came back as nothing. I was told to follow up in 6 months. Around 6 months later I went in for a routine visit for a yeast infection not worried about the last scare since it was “nothing” anyway and a week later they called and said that I had a bad pap smear but this time it was something different. This time I went in to have a scraping and again was reassured that it was nothing and that I never had a bad pap smear but they just wanted to make sure. Well a week later just before Thanksgiving I was told that I have “Carcinoma Insitu” and that it was non invasive yet but it was aggressively moving up my uterus. Since this was all done with my Gynecologist I decided to get a second opinion with an Oncologist and opted for a partial hysterectomy because there was no guarantee that it would not spread if they did a coning. I was very lucky that I only needed to receive a partial and I kept my ovaries but and it is a big BUT if I didn’t go to the doctor and follow up when I did months would have changed my life. My message to all women is that “GO for your YEARLY exam and don’t skip plus follow up and research your diagnosis even if they say its nothing!!! I am hoping to be there for the walk on September 12th with some of my friends and if I cant be there I will help in other way. I was diagnosed in May of 2006 with Ovarian Cancer. This was a very big surprise to me because no one in my family ever had cancer. I was the only one, so we were all taken aback. It started out with a pain on my left side. In May of 2005 I had told my GYN Doctor that I had stopped getting my period. She said it could be from me being pre-menopausal. She made me go through a series of test’s…CA125, thyroid, menopause and they came back negative. So she said don’t worry, I will continue to monitor you every 6 months. In three months I called her again to say I still had not gotten my period. She told me to come in again and she did the CA125 again and still negative. Now in 6 months she mentioned to me that I should wait a couple of months because it could be my nerves from stress at work. So, now I waited until it was 9 months and I called again. This time I went back to her office and she still could not find anything. A year to the day I could not take the pain I had on my left side and went to a health clinic that sent me to the emergency room. At that point in time was when they found that I had ovarian cancer and a tumor on my aorta. They did not know what to do. I was in the hospital for a week and all that they were doing for me was giving me pain killers because they felt that they did not have the proper expertise in that hospital to help me. The Dr’s there started asking me for my primary doctor’s name, my GYN doctor’s name and any other doctor that I had been in contact with. After my husband and I were able to provide them with these doctors was when they came up with Dr Chuang. Dr Chuang was recommended to me by my GYN doctor. The doctor in the hospital recommended that we go see Doctor Dr Chuang and that I be moved from Horton Hospital to Mt. Sinai. At Mt. Sinai, Dr Chuang explained to me what needed to be done. He was not able to perform surgery until he had a specialist that would be able to help with the tumor I had on my aorta. I waited a week for the two doctors to be able to perform both surgeries. Due to both doctors expertise the surgery was a success. While I was in the hospital Valerie and Arden came to visit me and told me about Woman to Woman. When I came home and Pamela called me and introduced herself as one of the volunteers and that was a survivor. That’s when I started to get all of my questions answered. Pamela helped provide me with the comfort that I needed to realize that I can over come this. Two weeks after I had surgery I started my chemo treatments. I decided to get my treatments on an out patient basis that was closer to home. My treatments were intense. I had to go for a week of chemo from 9:00 am to 5:00 pm every day for a week and then off for two weeks. I had to do 4 treatments so this really took a toll on me. These treatments were the worst thing that I ever had to go through. Every day I was poked with a new IV. By the end of my fourth treatments my arms were shot. On the last day of my chemo the nurse poked me four times before she realized that she just could not get into my veins any more. So she had to use a butterfly needle and get the chemo into me via my hand. This treatment took forever. Needless to say I was going to do whatever it took to make sure that I got this last treatment. Till this day my veins have not been the same. I have a hard time giving blood. Every time I give blood is like I am being but back in that chair when I was getting chemo again. I have to thank my husband, son, sister, and family for all of their support. They were my rock to help me get through this. They all alternated to get me to my treatments and back home. I could not have gone on this journey without their help and support. I love them all dearly! While I was going through my chemo treatment I was able to speak with Arden and expressed the need to want to help others as Valerie, Pamela and Arden did with me. It was comforting to have these three amazing women helping me through my process. I want to thank them for there support! Just like so may other people. The first thing I did was go on the internet. This provided me with a lot of information that was very disturbing. So having them guide me was a blessing. In 2007 I join these women and now I am also a volunteer and I look forward to helping other woman that needs our support. I’ve met so many wonderful families and patients that have helped me as while as I have helped them. It’s any experience that I am happy to be part of and look forward too. On September 26, 2008 I was diagnosed again with Ovarian Cancer. I had surgery again and was hospitalized for about 3 to 4 days. I did not have any chemo treatments but I did have to take a pill called Arimidex. It had side affects as well and after taking it for 6 months my Doctor has taken me off it. I would like to say that my cancer came back in late 2011. My doctors decided to wait to see if they can stop it by giving me chemo. I had chemo from Jan. to April of 2012. I was giving another CT Scan in Jan. and they saw it was still growing and realized that it had to come out. So, in June of 2012 I had surgery. As of today I am all clear and have been told by my Dr. that I am in remission. I think this is a good thing to say. I am was very happy to hear those words.